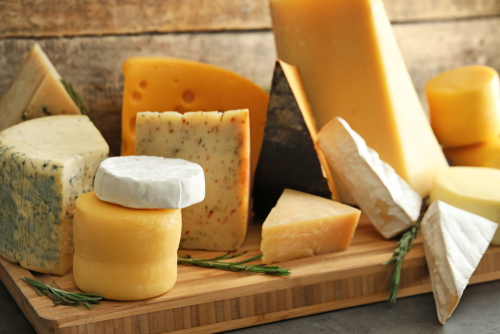 Cheese has been a staple of the human diet for thousands of years. It provided a way to extend the shelf life of milk from domesticated animals well after they stopped producing and was a ready source of protein, calories and nutrients as well as flavor. Today, cheese is less necessary for survival and more a delicious and versatile food that is loved by people in most parts of the world. 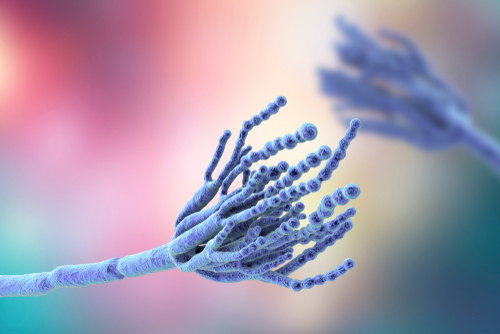 The main ingredients in cheese are milk, salt and microbes. This might lead you to think that cheese would automatically count as vegetarian, but that is not necessarily true. To make cheese, milk must go through a few processing steps. First, the milk is soured either with an acidic compound, a bacteria or both. 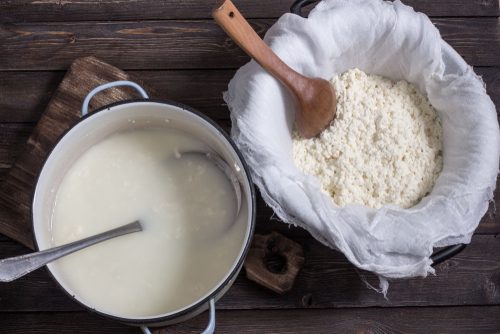 Second, it is curdled using an enzyme to separate the fats, casein proteins and other components into solid curds that are used to make the cheese. The liquid left after curdling is called whey. The whey is processed further into other products such as the lactose-free whey protein isolate that has become popular in the fitness scene. It can even be made into more cheese, meaning little is wasted. Next, the curds are treated in one of many ways to create different cheeses. Treatments usually include pressing to remove even more moisture and aging. For most cheeses, curdling is achieved using an enzyme called rennet. Traditionally cheese is made with animal rennet, which is made from the stomachs of young animals. Cows are most commonly used, but rennet can be found in other animals such as sheep and goats. Rennet contains multiple components, but the primary component, chymosin, is present in the mucosal lining of the fourth stomach of un-weaned calves. The stomach is harvested, and the rennet is processed out into a powder or liquid to later be used in cheese making. Of course, this is a problem for anyone who does not wish to eat food containing parts of an animal. Not all hope is lost for vegetarian cheese lovers, though. Rennet can also be made using plants or microbes, meaning no animal parts end up in the cheese. These alternative methods have been gaining popularity for reasons such as guaranteed supply, chemical purity, reaction predictability and influence from the growing vegetarian food market. How Do I Find Out if My Cheese Is Vegetarian? When it comes to the labeling​ of​ vegetarian cheese, most of the world​ does not require that products be labeled with which type of rennet was used​. Currently, the only country in the world that requires vegetarian cheeses be labeled as such is the UK. Any cheese that qualifies as vegetarian must be labeled with a V.
In the U.S., there are no such requirements. Consumers must either check with the manufacturer individually or find a reputable list of vegetarian cheeses. It is also good to look through the ingredients list for keywords, but they may or may not be obvious or entirely accurate. Here are some good keywords to look for. Enzymes – If you see enzymes on the label, that really isn’t going to tell you anything. Enzymes could refer to any type of coagulant including animal rennet. Sometimes the label will specify non-animal enzymes, which means the rennet is vegetarian-friendly. Vegetable Rennet – Seeing vegetable rennet on the label is pretty much a guarantee that the rennet used comes from a plant. Common plants used to make vegetable rennet are thistle, melon, safflower and fig leaves. This rennet is not as effective as animal rennet and so is used in larger quantities. Microbial Rennet – This type of rennet comes from the products of fungi or bacteria. The byproducts are fermented before they are added to cheese. This type of rennet is also vegetarian-friendly, but it does have one downside: It tends to make the cheese taste bitter, and the bitterness grows stronger the longer it is aged. This one is better for applications where the cheese is aged only for a short time. Genetically Engineered Rennet – Fermentation-Produced Chymosin (CFP) – Also sometimes referred to as vegetarian rennet, this rennet is made from microbes that have been genetically modified. The microbes are mixed with cells from a calf until the right combination is made and the microbes start making rennet that is practically identical to calf rennet. Vegetarian rennet can be made in large quantities and is just as effective as animal rennet since it is chemically the same thing. Enzyme Innovation offers SEBCheese Pro, an aspartic protease, which can improve taste, texture and yield of cheese. This is considered a vegetarian source because it is made by microbes, but some people may have a very strict definition of vegetarian and therefore will not consider this a vegetarian source due to its use of the genes from an animal. Each person will have to decide for themselves what they are willing to ingest. There are also cheeses made without any form of rennet at all. These are usually softer cheeses since the methods used to make them are less efficient at separating the curds from the whey. One common method is using an acid like vinegar or citrus to curdle the milk. An example is the Indian cheese paneer.